Lightahead New Creative Night Light and Lamp. 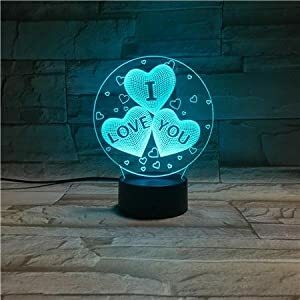 Stunning I Love You 3D Effect. 3D LED Night Light. Acrylic Colorful Gradient Atmosphere Lamp. Novelty Lighting for Valentine's day. Features: 1. 3D stereoscopic effect? laser sculpting; more than 95% light transmittance. 2. 7 Colors change: Red, Green, Blue, Yellow, Cyan, Purple, White. Your mood your colour. 3. Turn on light: touch the switch in 3 seconds, Turn off light: touch the switch in 3 seconds, Touch the switch 7 times in 1 second, color in turn to red, green, blue, yellow, cyan,purple, white, when you touch the switch 8 times in 1 second, the light will go to automatically color changing mode. Material: ABS & Acrylice. USB Powered (USB Cable included) or 3pcs AA batteries (not included). Accessories include: 1 *Arcylic Plate, 1 *ABS Base, 1 *USB Cable, 1 *Manual.